Saudi Arabia’s Red Sea Development Company has unveiled its tourism master plan, which seeks to create 70,000 jobs in the sector and contribute $5.86 billion to the kingdom’s GDP. It will not just contribute SR22 billion ($5.86 billion) to Saudi Arabia’s GDP, but play a major role in the kingdom’s economic-diversification drive – a chief objective of Vision 2030 – by attracting approximately one million tourists per year. 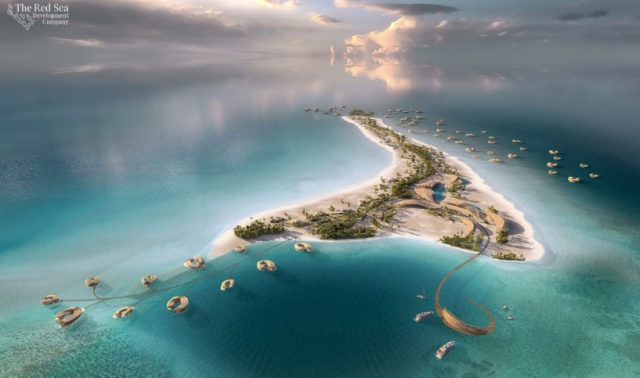 The Red Sea development project will turn jointly 22 islands into tourism resorts that will feature 3,000 hotel rooms, an airport, marinas, residential properties, recreational facilities etc. The project is scheduled to emerge by 2022 as part of Phase One of the mega blueprint. Red Sea Development Company CEO John Pagano was speaking at the visual presentation ceremony held in the presence of King Salman bin Abdulaziz at Araqa Palace in Riyadh on Tuesday. He underlined its economic and development goals and the project’s objective to become a global destination for luxury tourism. Crown Prince Mohammed bin Salman, Chairman of the Red Sea Development Company, was also present at the meeting along with senior company officials. King Salman lauded the team for planning a project that will propel Saudi Arabia to a prominent position on the global tourism map and create investment opportunities for the Saudi Arabian private sector – while simultaneously preserving the nation’s cultural and environmental heritage. Next articleFacebook Bug: Private Photos Of 6.8 Million Users Leaked!